Tomatoes (Solanum lycopersicum), although biologically fruits, are considered vegetables among chefs because of their low sugar content. Most tomato cultivars (of which there are many) have a tangy, acidic taste with a gelatinous center. Nearly all unripened tomatoes are green and turn red as they ripen. Wild tomates evolved in South America and turned yellow when ripe, thus inspiring the Italian name pomodoro (golden apple). Their descendants are now consumed and grown throughout the world, especially in western Europe and the western hemisphere. Chefs and cooks use tomatoes in sauces, salads, sandwiches and as garnishes. Also, bartenders use tomato juice in the bloody Mary, a widely popular, alcoholic cocktail. Tomatoes are rich in vitamins and antioxidants. They also contain MSG. The seeds are high in fiber and bitter-tasting tannins. The green parts are mildly poisonous because they're closely related to both nightshade and tobacco. 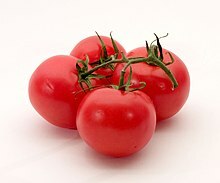 High cooking temperatures quickly destroy fresh tomato flavor, but can be useful to disable enzymes that tend to liquefy a tomato that has been injured (sliced, mashed, or shredded, for example). These tomatoes are used for juice production. When sliced into quarters, they go well in salads. When sliced thin, they go well in sandwiches. It is often easy to remove the gelatinous inner flesh and seeds from this type of tomato. These tomatoes are commonly 5 inches in diameter. One slice is enough to cover a large sandwich. It is usually very difficult to remove the gelatinous inner flesh and seedsfrom this type of tomato. In the summer, tomato growers produce many more tomatoes than they can possibly sell fresh. Many of these (usually plum tomatoes) are canned. Canned tomatoes often taste better than imported varieties in mid-winter or those grown in green houses. Tomatoes can also be preserved by being dried in the sun. This technique is popular in Italy. They are then either stored dry in packs (they need to be soaked before use) or in olive oil in jars (these can be used straight from the jar). The taste of sun-dried tomatoes is intense and concentrated. You can use them in pizza topping, where they go well with strong flavors like anchovies, capers and olives. This way of cooking tomatoes is described by Heston Blumenthal. It recognizes that much of what we consider to be tomato flavor comes from the scent of the green stem, or vine. The vine is not edible and its fragrance is destroyed by heat, but this method goes some way to capture it. Peel the tomatoes as described above. Cut them into small pieces and remove the seeds. Put the cut tomatoes in a sieve above a bowl, and salt liberally. Leave in a cool place for an hour or more. The salt will draw liquid out of the tomatoes, which will collect in the bowl. Use the liquid as a basis for cooking the tomatoes quickly (Blumenthal suggests using a pressure cooker). This avoids adding any water, and so concentrates the flavor. When the tomatoes are cooked to a puree, boil in an uncovered saucepan until the liquid is reduced. Then cool the puree, and put in an airtight container with the vine of a tomato plant. Store for an hour or more, while the tomatoes take on some of the fragrance of the vine. Discard the vine and use the sauce as the basis for a pizza topping or a sauce to accompany fish, meat, or vegetables. For information about growing Tomato, see the chapter on Tomato in the Horticulture book.